A communion is meticulously performed before a dwindling congregation: a school teacher, Marta, a troubled parishioner, Jonas Persson and Jonas' wife, Karin. But the religious ceremony has lost its significance for its message-bearer, pastor Tomas, who has a crisis of faith. Tomas's inner predicament is fittingly captured by a series of close ups, a characteristic of Bergman's cinematic signature. Tomas is callous and uncaring to the woman, Marta, who loves him. His interactions with Marta are mostly mechanical and ultimately acrimonious. When an apprehensive and suicidal Jonas seeks peace on a perceived imminent nuclear holocaust, equivocating Tomas offers his own uncertainty. Jonas gives in to the internal crisis, laden with faith, and commits suicide. The most bare and visually somber of Ingmar Bergman's religious trilogy, Winter Light, the second film of the trilogy, is a film in transition. 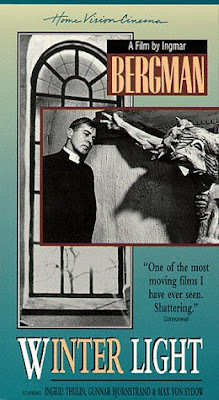 It marks Bergman's final exploration of religious faith, or of the reasons to doubt the lack thereof, and serves as an overture to the psychological drama, the last part of his trilogy. Similar to Through a Glass Darkly, minimal cast, dialogue, and scenery suffuse the film, squeezing out the atmospheric tensions of the plot to its fundamental essence: God's silence. The unique use of monologues, elongated silences, and extreme close-ups convey emotional plights of the characters and paint a picture of emotional isolation. In perfect harmony are the barren landscape, seasonal climate, and Tomas' illness that further reflect the cold emptiness of his soul. In the final scene, Tomas returns to the obligation of the ceremonial communion attended by a meager mass. Tomas is seen to minister the vacant words for those who solicit comfort from their lofty meaning, extract from them stamina for their spiritual solace and emotional composure. 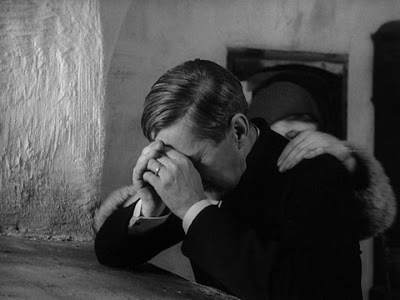 “Winter Light” by Ingmar Bergman (1962) is the second part of his “religious trilogy” (the first, “Through Glass Darkly” – 1960, and the third, “Silence” – 1962). In the first film, the basic (for achieving enlightened life) human abilities – to love without psychological defensiveness and to be vital without de-sublimation, that together as a sacred combination make human beings spiritual creatures, leave the existential circumstances of human life and retreat to “heavens”. In the third film of the trilogy “god” (the form in which the unity of human love and human vitality take place outside life) has “died” and human beings have to start from the beginning. But “Winter Light” depicts the situation when “god is silent”, and human beings slowly grow towards understanding that it is up to them to return their libidinous vitality back into the (earthly) life. In all of the films of trilogy Bergman’s points about spiritual life are mediated by the scrupulous psychological analysis of the characters. “Winter light” is a metaphor of light of love/vitality in a condition of being distant from human life. The film depicts the Christian faith of seven characters – Pastor Tomas Ericsson and the six parishioners of his Church (three men and three women). Each protagonist‘s faith is uniquely created by their individual intelligence and will in the unique circumstances of each of their lives. Bergman approaches each character’s religious belief as sacred reality, as a precious creation. Some of the personages he personally admires, some he respects and others are objects of his “loyal criticism” that is full of empathy and good faith. The frankness and gracious intensity with which the director depicts the human destinies and encounters between the characters are overwhelming, as much as actors’ performances make each individual soul radiate its own truth. Each personage is represented as having been formed by life and human history, nothing is fabricated in order to entertain or sentimentally please the audience. With all seriousness, the film is so congruent with human emotions that it is taken inside human soul as naturally as air for our lungs. The film addresses Christians of various denominations, as much as people of other beliefs and non-believers with equal authority, and is an icon of not only a philosophical, but a humanistic cinema. The film confirms that Bergman’s cinema is made for 21st century even more than it was for 20th century. Thanks for your superb analysis.